This Infiniti QX80 provided precisely 700 miles of driving pleasure. When taking to the road, you need a reliable car. A meaningful bonus is any model that gets you there in style. This past week an Infiniti QX80 was my weekly driver and I also received an added bonus of my own: permission to take it Washington, DC, and back, covering 700 miles with my two teenage sons who were along for the ride. It was a boys weekend out and the strapping QX80 supplied everything we needed to make the trip a thoroughly enjoyable one. The Infiniti QX80 is the brand’s largest model, offering room for seven or for eight when the middle row seats are replaced with a bench seat. It was originally known as the QX56, with the “56” pointing to the model’s 5.6-liter, V-8 engine. Briefly, it sported the QX moniker alone before assuming its current name. Beginning with the 2014 model year, Infiniti overhauled its naming convention and the big SUV assumed its current QX80 moniker. It is a second generation model, introduced in 2012 and eight years after the first model rolled out. Notably, the first generation model was underpinned by the same platform powering the burly Nissan Titan pickup truck as well as the large Nissan Armada SUV. The current model is related to the Nissan Patrol, a vehicle that is not sold in the US. In the QX80, Infiniti offers a compelling response to consider it over large, opulent SUVs such as the Cadillac Escalade and Lincoln Navigator. It also competes against the Audi Q7, Mercedes-Benz GL-Class, and the Lexus LX 570. On street parking near the National Mall. The QX80 is one of four SUVs sold by Infiniti. A fifth model, the QX30 is on its way. The two-wheel drive model is priced from $63,250; the all-wheel drive model starts at $66,350. Typical of Infiniti, you get one trim level and can build it out from there. But beginning in 2015, Infiniti has rolled out the Limited package to take this model to where no Infiniti has gone before. In other words, Infiniti has upped the craftsmanship quotient a notch to convey a vehicle that matches the top-of-the-line editions for what its competitors offer. You will pay for this package too. Ultimately, it unites five distinct packages — driver’s assistance ($2,100); theater ($2,400); deluxe technology ($5,500); Limited ($10,000); and tire and wheel ($2,450). That’s about $22,500 of goodies that we’ll inspect at length later. Infiniti pairs the QX80’s V-8 engine with a 7-speed automatic transmission. The engine makes 400 horsepower and bangs out 413 foot-pounds of torque. That’s puissant performance you need to move this three-ton beast. Thankfully, the powertrain is up to the task. Loading the QX80 means making an immediate decision: do I pack in the tiny storage area (16.6 cubic feet) behind the third row seat alone or make use of some other option. Folding the third row seat is possible if there are no more than four of you present, otherwise you will need to place your extra luggage on top. A long weekend away meant we brought with us a lot of stuff and what didn’t fit in the back we put on the floor in the third row. Once you are packed, then get settled in. One of the goodies found in this model is an innovative DVD entertainment system with bright, 7-inch screens affixed to the back of the front seat headrests. My boys used it, loved it and you probably would too. The $2,400 price tag seems steep, but the theater package adds heated outboard second-row seats and remote tip and flip middle row seats too — an excellent feature to help you access the rear row. The Limited package took an already above the conventional model and makes it extraordinary. On the exterior, Infiniti matches the all-season rubber with natty 22-inch, dark chrome finish wheels. The “dark” leitmotif continues with the lens around the headlights and tail lights as well as to the exterior trim and roof rails. Stainless steel running board caps and illuminated kick plates add further lift to the visage. Inside, take note of the upscale cabin replete with leather, ash wood trim, and an ultra suede headliner. Distinctive quilting on the seats, the storage compartments and door inlays add further luxuriance to the interior. 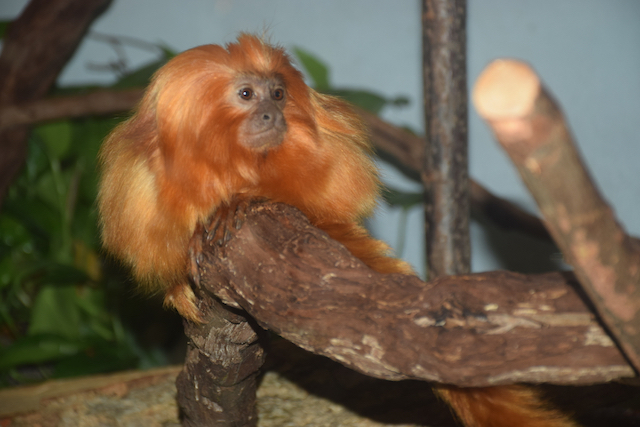 A golden lion tamarin at the National Zoo in Washington, DC. Press the accelerator and the engine immediately responds with every horse that you need. The transmission shifts smoothly through all seven forward gears and brings this SUV up to highway speed without delay. It is easy to rely on the power to get the job done. Furthermore, that power provides 8,500 pounds of towing capacity if you are so inclined. What the QX80 doesn’t do is deliver pleasing gas mileage numbers. In fact, each of my earlier tests of the Lincoln Navigator, Cadillac Escalade and an assortment of Chevrolet and GMC trucks reveals the same thing: you would be hard pressed to get better than 15 mpg. This SUV is EPA-rated at 14 mpg in the city and 20 mpg on the highway. We averaged 15.5 mpg and that was with cruise control active along the interstate. Washington, DC, is not a vehicle-friendly city. The District does everything to discourage driving, by providing an excellent mass transit system composed of subways and buses. Trouble is, when you’re riding underground you miss what is going on above ground. And in DC that means everything. And to emphasize matters, driving around the city is a BEAR, especially during the week. Fortunately, Saturday and Sunday were the days when we were in the city proper, staying 12 miles outside of The District each night. 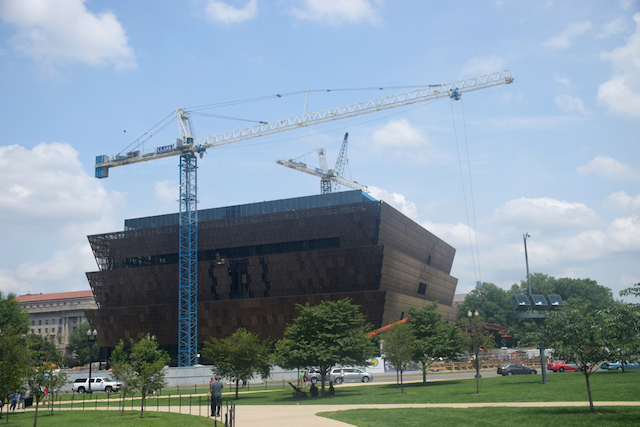 Rising Up: a new National Museum of African American History and Culture. 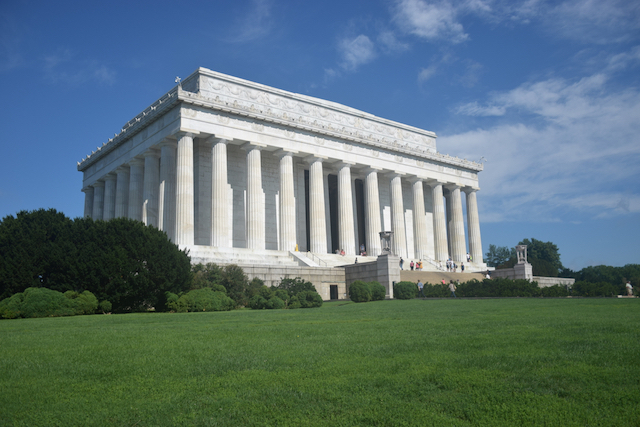 Although mass transit was relatively close by, we chose to drive and headed straight to the National Zoo in the upper northwest part of the city. You can pay for parking or you can save $20 and park on the local streets. We chose the latter and found a space about four blocks away from the entrance. There was no need to parallel park this time around as we located an empty spot near a side street. After the zoo, we drove through the city and stopped near Howard University for lunch. The GPS was precise, presenting clear instructions along the way, although we did figure that the Chick-Fil-A was located in the university, which was closed. Subway was another option and we managed to find a free parking lot nearby. Once lunch was done we headed to the National Mall area. 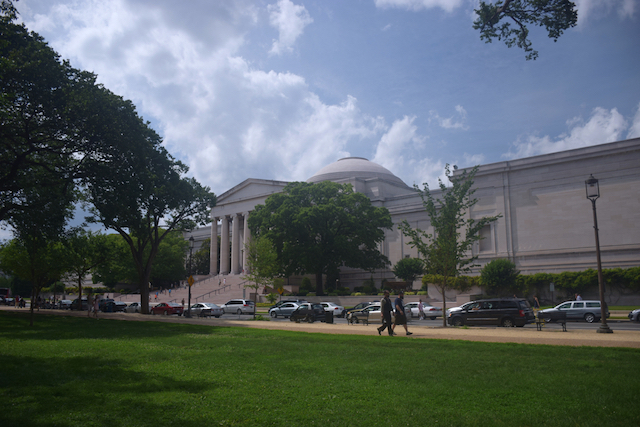 Our trip was composed of mostly Smithsonian destinations, which meant hunting for parking. 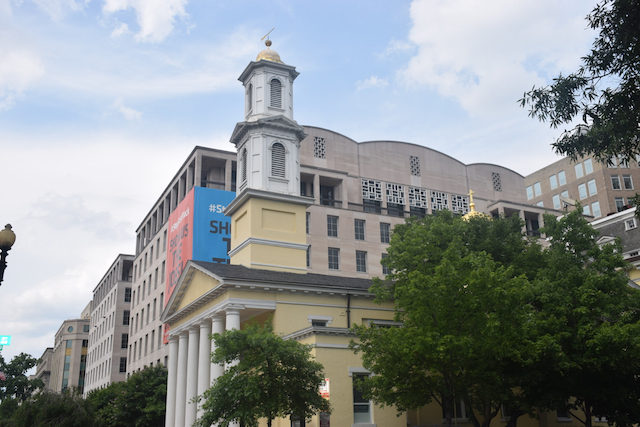 Oh, there is plenty of off-street parking in our nation’s capital, but we managed to find a spot on the street directly across from the Smithsonian National Museum of American history. 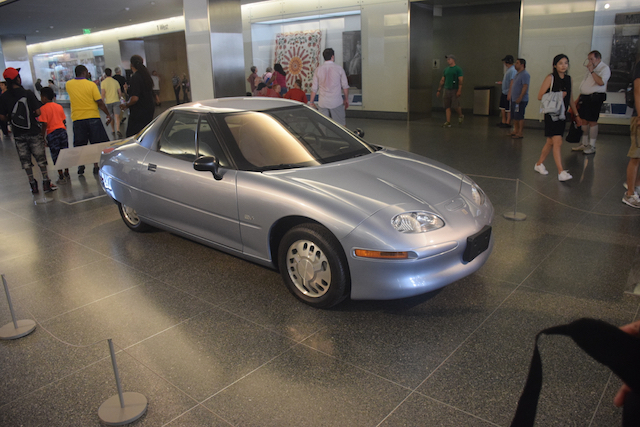 The GM EV-1 on display at the Smithsonian. Two things to keep in mind: you’ll be parallel parking a big SUV and you’ll also have to feed the meter. The parallel parking wasn’t all that dramatic and you always have the rear view monitor to guide you. I ended up parking a foot out from the curb, then decided to move the QX80 within six inches to avoid a ticket from a pesky traffic attendant. Pay close attention to the meters too: we were limited to just two hours and made our plans accordingly. It was the only time we had to pay up. Fortunately, it took a credit card to cover my $4 fee. There are plenty of other places around DC, where meters aren’t acting as sentinels in a bid to drain you of your cash. The National Mall area has on street parking sans meters and usually someone is pulling out as you want to pull in. You just may become a parallel parking pro, but please avoid curbing the beautiful wheels. Safety is a big deal for any model and the QX80 has you covered. You get backup collision warning, backup collision intervention (to apply the brakes if you don’t), blind spot warning, blind spot intervention (to move you back to your lane), lane departure warning, lane departure prevention, forward collision warning, and brake assist. SUVs in this class routinely have some sort of adaptive cruise control. Infiniti calls it intelligent cruise control with full-range speed. The system adjusts the QX80’s speed according to your distance needs. You can also shorten or lengthen the space between cars, an entirely useful feature in heavy interstate traffic. 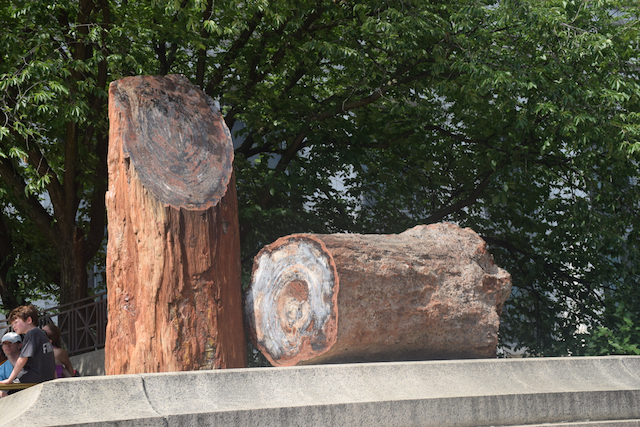 Washington, DC, near the White House. One feature we didn’t use because I am stubborn as a mule, is the Infiniti Personal Assistant. This service supplies a live assistant 24/7, an individual who will help you book hotel and restaurant reservations, make flight check-ins, and handle general trivia. If it works according to plan, you may have a better and more pleasant source than Siri. Infiniti offers this service to customers for the first four years of vehicle ownership. As far as seating goes, the first and second row passengers have it all. When you get to the third row, the seat is best used by the smaller people in your family as the thigh support goes wanting and padding is not thick. This deficiency is typical in most three-row SUVs and should be kept in mind when considering the segment. One workaround is to explore the slightly smaller, but roomy Infiniti QX60, a crossover SUV with room for seven. Lastly, the body-on-frame Infiniti QX80 is entirely suitable off road as it is around town. To aid you in your quest, there is a big dial located between the stick shift and the storage compartment, one that controls four-wheel drive modes at the push of a button and a flick or two of the same. You get snow and tow modes here too — and for the sport-minded among us, you can turn off the stability control, if desired. 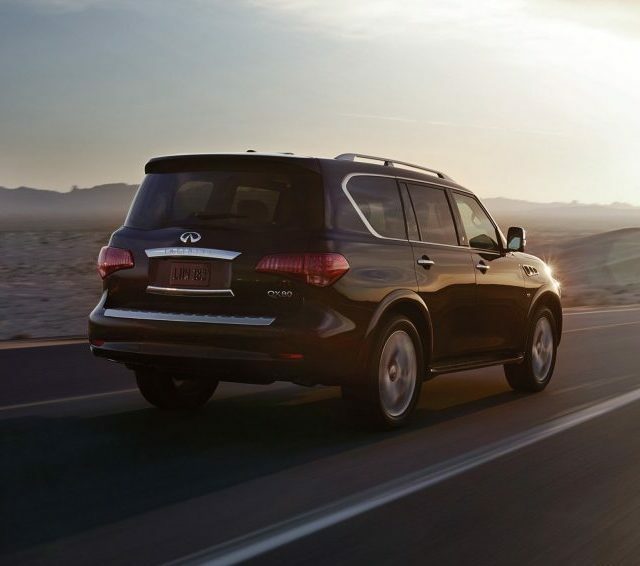 To sum up, the 2015 Infiniti QX80 meets expectations for the large, luxuriant SUV segment. In addition, it does this by offering an ideal blend of creature comforts, technology and performance, in a package that is evocative, swanky, and intrepid. 2015 Infiniti QX80 and Washington, DC, photos copyright Auto Trends Magazine.